We recently partnered with a company, ShopKeep, to provide a point of sale (POS) program for iPad and Mac computers. It’s often a tough decision for a merchant to move up from a simple credit card terminal to a POS system as there can be significant costs and time in training and implementing a POS system. POS systems traditionally handle inventory and pricing in addition to acting as a businesses cash register. They are often locked into specific credit card processors that don’t always have good customer service or reasonable rates. The ShopKeep POS system is a great stepping stone for merchants that are looking to move up to an entry level POS system. ShopKeep POS is built to use an Apple iPad as the base computer for the system. It is essentially a web based software service that performs the normal functions of a point of sale system. From there a magnetic credit card reader is added in addition to a stand and a cash register for most merchants. This system tracks inventory and will support bar code readers, printers and a variety of other traditional POS requirements. Currently ShopKeep is only available to merchants located in the US and Canada. The magnetic card reader is the Magtek idynamo or dynamag which are completely secure card readers that encrypt a transaction as the card is being swiped. Printers, bar code scanners, display stands, cash drawers, and other traditional peripherals can be added to an iPad allowing ShopKeep to replace most traditional POS systems. 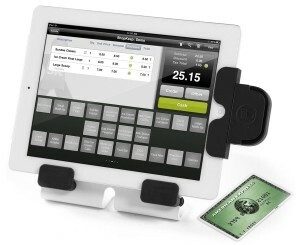 Since ShopKeep is built using an iPad, it makes a very sleek, compact, and high tech looking POS system. The ShopKeep software is easy to use and can be customized to fit a business’s specific requirements even with multiple locations. ShopKeep processes credit card transactions over the internet by connecting to a payment gateway. This facilitates near-instant processing times as long as an active internet connection is available. It also enables inventory and pricing to be controlled centrally if a merchant has more than 1 location. ShopKeep handles sales tax and tips and other common functions as it should. Like most Apple software, and unlike many POS systems, the merchant interface is well thought out. Screens are clean, easy to read, and easy to advance or back out of. User priviledges can be controlled for greater security. Sales and inventory reports can be built, and customized down to individual inventory items. ShopKeep can export several file types into quickbooks accounting software. The software should meet the requirements of most small to medium size retail merchants. If you’re in the market for an entry POS system, or you have an iPad that you would like to use for your processing take a look at the ShopKeep iPad POS System. Very cool. We look forward to trying one of these.